With a constant flow of changes to Facebook since its inception, brands on Facebook today cannot rely on fan-gated content to appeal to their target market… they need Facebook marketing tips and strategies that actually encourage more engagement on the social media powerhouse. The relevancy of content on Facebook is very important in getting a slice of the user’s time spent online. 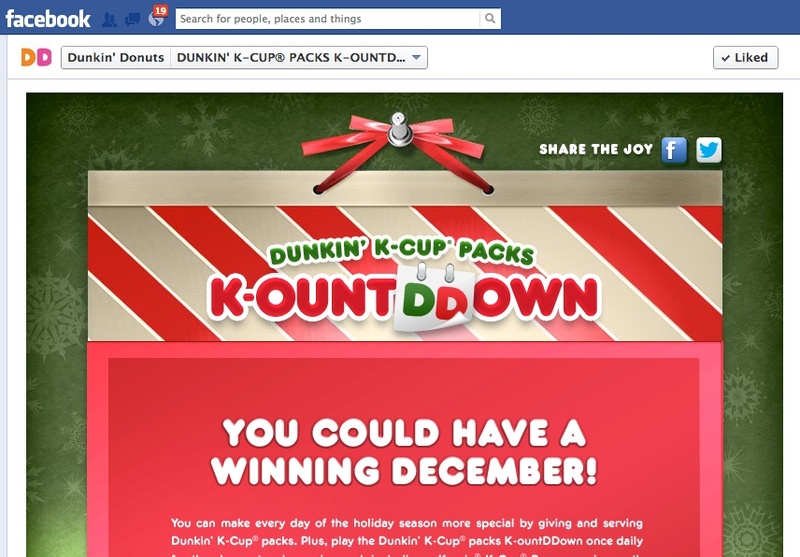 For companies and brands, Facebook offers community engagement and customer relationship building avenues. Climbing the ladder of Facebook engagement requires posting visual content along with interactive elements. The more your fans interact with you, the more reach you will have among your desired target market. Building a Facebook community requires dedication, effort and strategy to attract new people and to keep those who have liked your page. The major challenge is to encourage interaction from those who have become your fans so that an active online community can be maintained. This can be done by posting compelling content on your timeline. The Timeline feature has made it possible to add content to any point in time. A brand page can have important events and achievements in its timeline. This brand story coupled with pictures can be used to create brand engagement and enhance the brand image. (Tip: If you run/own a brick-and-mortar business, create a milestone for the first day you opened your doors. 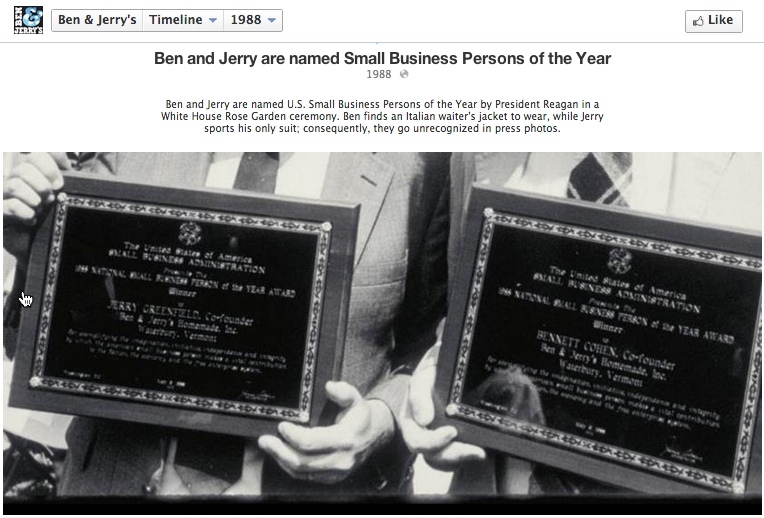 This exactly what Ben & Jerry‘s did with a milestone on their Facebook Timeline. It is highly likely that people who end up browsing your page might find your content interesting enough for them to like the page. By pinning those posts on your Facebook Business Page that you want people to see when they first land on your page, you might just be able to draw their attention to the right elements. 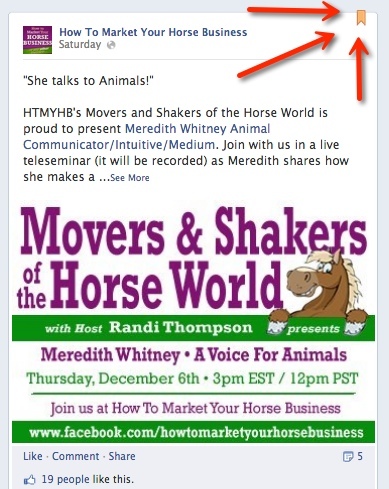 Pinned post below is from How To Market Your Horse Business Facebook Page. Pictures appeal more than plain text when users browse through their news feed. Using interesting pictures that are worth a pause along with questions to entice customer responses is a great way to drive traffic. 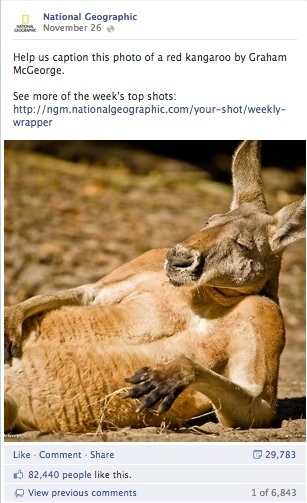 For instance, National Geographic posted a photograph of a laid back kangaroo and asked fans to respond with a photo caption. Social gaming not only attracts high volumes of users, it also engages those players for long periods of time. By integrating your brand with the social game through fun facts, calls-to-action, and giveaways, you can achieve your goals of fan growth and engagement. 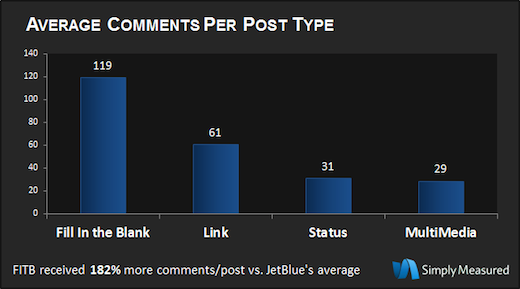 Right from school tests to Facebook timelines, Fill in the Blanks are platforms where fans can use their creativity to react and interact with the posts just like JetBlue Airways did with their Facebook Post below (measurements provided by Simply Measured). If you company or brand is looking to enhance it’s Facebook engagement with your target audience, try some of the Facebook marketing tips and strategies listed above. You never know… this may be just what you needed to get your Facebook Business Page’s party started!